If Microsoft Edge keeps crashing every time you open it after installing Windows 10 build 14942, try this workaround to fix it. However, we all know beforehand that installing early versions of Windows 10 from the Fast rings means higher chances of coming across bugs and features not working correctly. A good case and point is the recent Xbox sign-in failure after installing the latest Windows 10 Redstone 2 update, which fortunately Microsoft was able to provide a workaround. Now on Windows 10 build 14942 a small number of users are reporting that after installing the latest update Microsoft Edge keeps crashing every time they try to open the browser. 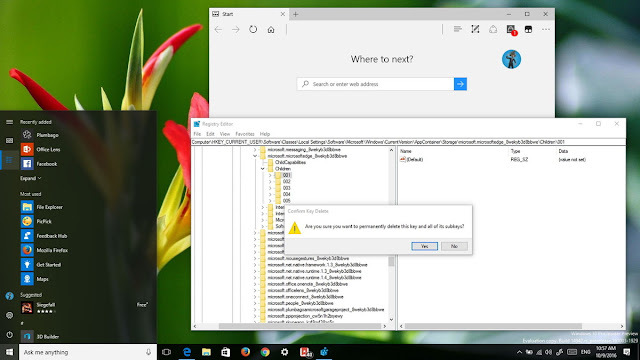 While the company hasn't included this particular problem in its list of known issues for Windows 10, a workaround has surfaced that it seems is working for those affected. Important: Before proceeding with this guide, you should know that modifying the registry is risky, and it can cause irreversible damage to your installation if you don't do it correctly. It's recommended to make a full backup of your computer before proceeding. Use the Windows key + R keyboard shortcut to open the Run command, type regedit, and click OK to open the Registry. Right-click each subkey (subfolder) key and select Delete. Click Yes to confirm the deletion and to complete the task. Important! Do not delete the Children key, which will prevent Microsoft Edge from starting up, only delete the subkeys. Once you deleted subkeys manually, you should now be able to launch and use Microsoft Edge on Windows 10 build 14942 without crashes.